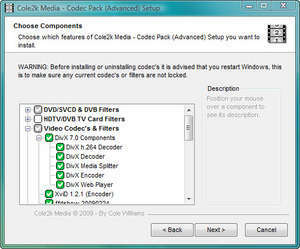 The Cole2k Media Advanced Codec Pack features a collection of codecs and filters for encoding/decoding a large variety of video/audio formats. Support for formats currently includes DivX 6, DivX Media, XviD, 3ivx, MP4, h.264, x264, AVC, Nero Digital, MPEG-2, AC3, DTS, AAC, APE, FLAC, MPC, OFR, TTA, OGG, Vorbis, WavPack, MP3, and ATRAC3. Windows MCE (Media Center Edition) is fully supported. Version 8.0.1 is a freeware program which does not have restrictions and it's free so it doesn't cost anything. For security reasons, you should also check out the Codec Pack - Advanced download at LO4D.com which includes virus and malware tests. Additional screenshots of this application download may be available, too. 3.6 out of 5 based on 5 ratings. Codec Pack - Advanced has a presence on social networks.